Ypsilanti's Brandon Morris (center) led the Phoenix with 20 points, in a 65-40 victory against Lincoln. 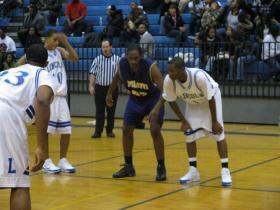 Jan. 7, 2009 · 11:11 a.m.
Ypsilanti had a two-game skid heading into their matchup against area rival Lincoln. They left with a convincing 25 point victory, 65-40. Both teams were amped up to begin the game, starting at a frantic pace with turnovers and forced shot attempts. Aggressiveness put Lincoln (1-1, 0-0 S.E.C. White) in early foul trouble. Starters C.J. Luvene and Keandre Taylor each had two fouls by the end of the first quarter. Senior forward Ryan Walton scored 7 first-half points helping the Railplitters stay close early on in the game. Walton and junior guard Latwan Wesley had a team high 9 points. Ypsilanti (2-4, 0-1 Mega Red) leaned on their two big men to build a lead in the second quarter. Junior Ty’Shaun Allen scored 8 first half points to finish with 13, and senior Brandon Morris had 10 first half points and ended up with a game high 20. Allen and Morris powered the Phoenix into halftime with a 23-15 lead. The second half belonged to the visiting Phoenix. The team outscored the Splitters 20-12 in the third quarter and took a 16-point lead into the fourth quarter, 43-27. A short bench of only four players hurt Lincoln, who could not mount a sustained comeback. The substantial lead was quickly pushed to more than 20 points in the fourth quarter with a Morris layup, scored while being fouled. Ypsilanti’s Connor Heine also had an impressive steal off an in-bounds pass. Lincoln never gave up, pressing the rest of the game. Between good guard play and making late free throws, they couldn’t cut into the Phoenix’s lead.